The last of the "Tanks"
The Zenit 12, what is there to tell? To many people it is considered to be the last of the really durable Zenits. A direct decendant from the Zenit-TTL and the infamous Zenit E type which in turn decended from the Zenit 3M/Krystall. In contrast of the Zenit-E it has TTL metering. And Yes, there is a Zenit 11. 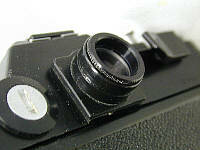 In fact the Zenit-12 is a modernised Zenit-TTL. 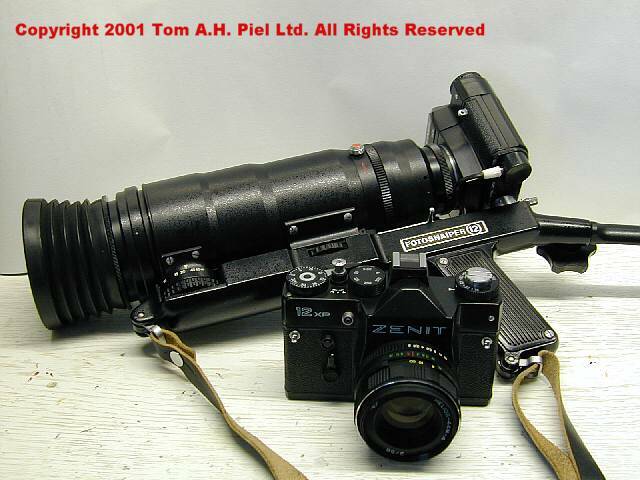 Time for some production numbers (from Princelle) Zenit-TTL 1.6 million units plus. Zenit-12 with all it's versions 1,17 million units. There are, 12s (with needle meter), 12cd (domestic version) and the 12xp (export version). If we include the Snaiper version,the FS-12 which had 3 versions, we get a grand total of 1.29 million cameras. Aside for some cosmetic changes the TTL and the 12 are in fact identical. This is the last of the true all metal zenits. Pherhaps it closes the era of the full metal cameras. Unfortunatly not all 12's are full metal. The 12's turning point for ABS plastics was around 1989, when KMZ made the topcover of the 12 out of ABS plastic. At the moment I own one FS-12 which is incomplete but has the plastic top and two all metal 12 xp's which aside from the Zenit-19, which is my favourite Zenit, rank among my favourite cameras. IMHO I consider the Zenit-12xp to be one of the best workhorses to come out of KMZ. It's durable, has straplugs, TTL metering which inspite of it's quirky 2 led system actually works and even measures accurately. And the led system has another advantage which is easily overlooked. You can still read it at Fstop 16, which was hard using the needle meter at the good old TTL or on the Mighty Zenit-19. The 12 like its brothers takes auto lenses with it's M42 mount. Or any other M42 lens for that matter. So far I've used my 12xp with, Helios 44-4, Mir 20mm, MTO 550mm, MTO 1000mm, Tair 300, Mir 1b 37 mm Paragon 28mm, Unitax Zoom 80-200mm and a Soligor 400mm. The only disadvantage it has, is that it doesn't have enough speeds. But did I mention that it came with a leather ever ready case? With a delightfull smell, plastic cone unfortunatly but with the delightfull leathery smell we all have to love on this great camera. It's a camera you can depend and rely on for many years. Both cameras next to eachother. The 12xp and the FS-12 with the 12xps. FS stands for FotoSnaiper. Lets look at the Zenit-12xp and the Zenit-12xps in more detail. Reason? The FS-12 is the best in FotoSnaipers to get. The two most important differences between a normal Zenit 12 (or normal slr if you like). At the bottom of the cameras they are quite obvious. The FS-12 (or 12xps) carries two extras. First is the extra shutterbutton in the middle. It's operated by the trigger of the FS-12. 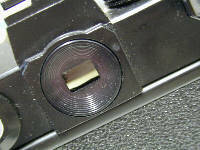 The other, the cable and the little box on the edge of the camera, are part of the open aperture measuring system. 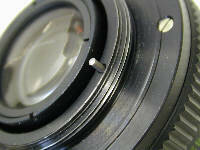 The FS-12 lens, in contrary to the 12's standard lens, has a so called jumping aperture. You focus the lens, pull the trigger just a bit to close the aperture on the lens, pull a bit more to make the shot. The trigger serves 2 functions. 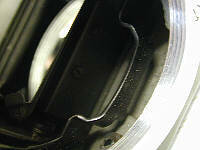 The difference in eyepieces between the FS-12 xps. Note that it also comes with an extra rubber eyecup that fits over the enlarged eyepiece on the left. 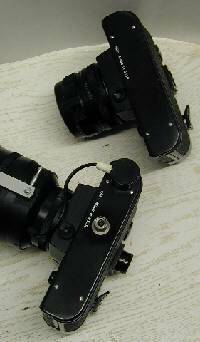 The right shot is the normal eyepiece. Here we also find the main break down point of the 12 (if we don't count batteries). Lightleaks around the eyepiece that mess with the lightmeter. Close up shot of the lightmeters Gost/ASA settings. Please note that this is not like normal ISO or Din settings. But it can be easily worked out. This 12xp is set to 100 ISO. 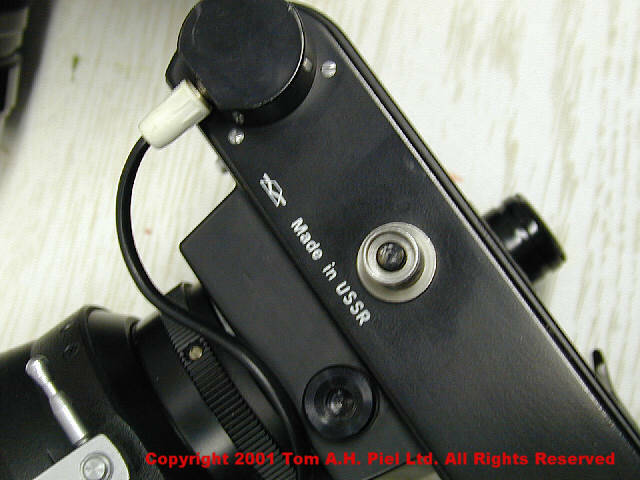 Close up shot of the mount and auto aperture lever. If this is gone you can still mount a "normal" helios-44-2 or Industar 50-2 AND still have a working camera with a working lightmeter. Not that it fails often... actually never. But it is the thought that counts. This camera can take a beating and it will be back for more. Close up shot of the Helios-44-4 58mm/2 standard lens. 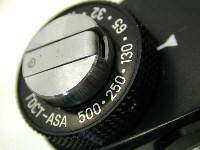 Note the pin for auto aperture. This is a very good lens. Fast and sharp with nice contrast and multicoating.